Each month, AurStaff® proudly honors an employee who demonstrates the highest level of dedication, integrity, and performance while on assignment in a supplemental or project capacity. Congratulations to AurStaff’s most recent Employee of the Month! Denovous has been working with AurStaff since August of 2017. He has completed many assignments for us and has continuously proven a great work ethic through the many compliments we have received from his supervisors. 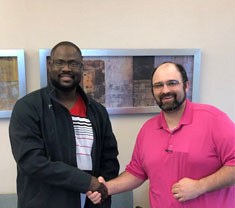 Denovous' expertise ranges from Machine Operating to Installing and he is currently working in a warehouse sorting and building orders for healthcare facilities in the Omaha Metro area. According to his current supervisor, "Denovous is an amazing worker and if we could find more like him I would like to add to my riches." Thank you, Denovous, for your hard work and dedication. We appreciate you!